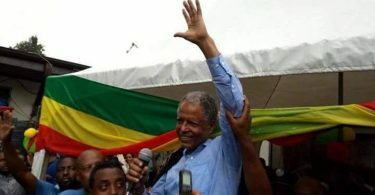 (OPride)—Barely 24 hours after his release from a maximum security prison in Ethiopia, where he spent the last four years on death row, rebel leader Andargachew Tsige on Wednesday met with Prime Minister Abiy Ahmed, who sanctioned his surprise pardon. It’s a rare conciliatory gesture, unimaginable even two months, by the leader of the long-ruling Ethiopian People’s Revolutionary Democratic Front (EPRDF). Andargachew was nabbed at Sana’a airport in 2014 while traveling through Yemen and forcibly removed to Ethiopia where he was already condemned to death in absentia. At the palace meeting on Wednesday, the two leaders were all smiles as they shook hands. The photo, released by Fitsum Arega, the chief of staff at the prime minister’s office, broke the internet. Many Ethiopians and diaspora activists seemed shell-shocked by the image and the gesture. Historical, amazing, shocking, huge, unprecedented, photo of the year, bold and remarkable were few of the words people used sharing the photo of the two leaders. Andargachew’s release from prison and the exuberant reception that awaited him at his parents’ home made global headlines on Tuesday. People knew it was coming, the rumor mill had been fraught for weeks with speculation of his impending release. But few, if anyone, expected Andargachew to confer with the prime minister until Fitsum shared the image of a man once deemed a terrorist and a threat to national security meeting the head of the state. It led to a warranted outpouring of praise on social media; the image had now gone viral, widely shared and retweeted by netizens around the world. Prime Minister Abiy has many supporters and skeptics. But with this latest gesture, extending an olive branch to a man accused of plotting a coup against the EPRDF regime, he not only won over naysayers but cemented his sincerity and willingness to reach out across the aisle and engage the political opposition in dialogue. The meeting with Andargachew came a week after he welcomed home members of another exiled opposition party, the Oromo Democratic Front. No other details of the discussion between the two men were disclosed. However, it is more than likely that the Prime Minister broached the possibility of bringing Andargachew’s Ginbot 7 into the political fold. On the same day Andargachew walked free, his colleague and Ginbot 7 chairman leader Berhanu Nega, had all charges against him dropped. Even people reputed as ardent critics of the EPRDF couldn’t help but express their delight at seeing Andargachew being dignified with a meeting at the palace. 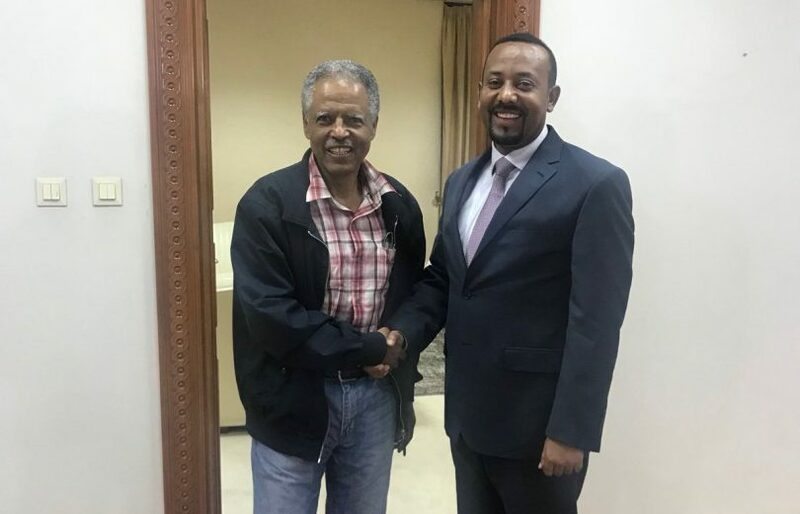 “Abiy’s pragmatism had him invite a rebel leader to the palace,” tweeted Befekadu Hailu, a prominent blogger and activist in Addis Ababa. “He has conquered the hearts of Ethiopians. Optimism is skyrocketing!” said his colleague at Zone 9 collective, Abel Wabella. Both Befekadu and Abel have served lengthy stints in prison — for blogging. Such an endorsement from those who have been victims of the EPRDF regime speaks volumes to the sweeping political changes in Ethiopia. Adulation for an Ethiopian leader on this scale is unprecedented in the EPRDF era. Prime Minister Abiy, who took over from Hailemariam Desalegn barely 60 days ago, enjoys very high approval ratings across the country. 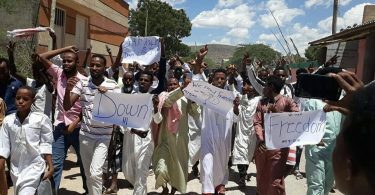 Comments and reports on his style of politics and actions have flooded Ethiopian cyber forums while negative banter about his administration is becoming increasingly hard to trace. EPRDF, in power since 1991, has a global reputation for its razor thin tolerance of political dissent. Protesters, activists, journalists and political opposition have been characterized as terrorists and proxy elements of hostile nations. Security forces killed more than 1,000 protesters in 2015 and 2016 in Oromia and Amhara states. Tens of thousands of political prisoners were thrown into jails often on trumped-up charges. Thousands of these detainees have been freed since January as part of the government initiative to build national consensus. There are now plans to amend or repeal the infamous Anti-Terrorism Proclamation, a draconian legislation the broadly applied to stifle dissent. Abiy’s administration has signaled in more ways than one that it is serious about shifting away from the party’s established autocratic posture. With the overall direction things are heading in and an iconic photograph for the ages, more and more Ethiopians are daring to dream. That’s a good thing. Abiy is moving sooo fast that we are not even keeping track of the changes in #Ethiopia. Sometimes i feel like we are on a political roller coaster. Day after day, there is something new, something significant or something stunning. Meeting Andargachew tops the list. ይህን አይቶ አለመገረም ይቻል ይሆን? ብዙ ግምቶች ፉርሽ የሆኑባቸው 60 ቀናት። መጪውስ…??? Kudos to Prime Minister Dr. Abiy Ahmed. He is trying to change the prevailing political culture that existed in Ethiopia for centuries. Please note that the notion that a goverment in power has to eliminate all opposition by all means in order to stay in power is archaic, and no longer viable. I’m hoping we as a country will learn a lesson or two from this historic moment. I’m hoping Haile Mariam Desalegn and his bosses will make a formal apology to Ethiopian citizens brutalized under their watch for the past 27 years.